I was busy thinking about Christmas last month as I love to introduce a few festive things to my home in advance, a bit like a Countdown to Christmas! I start with a few table decorations, some original vintage and some handmade, created by my whole family. 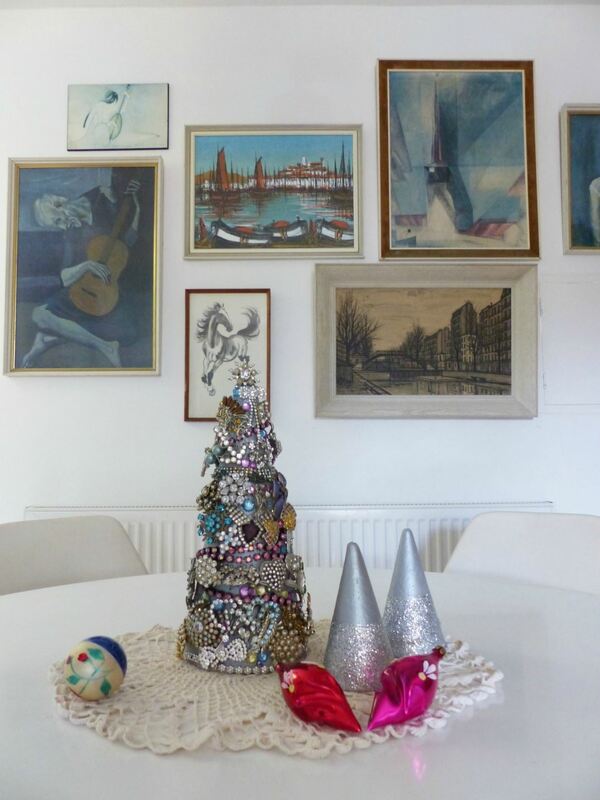 This year I have made a Christmas tree using old broken bits of jewellery to create a sparkly jewelled effect, that not only matches the eclectic feel to my home, but also is bright and fun to put a smile on our faces every morning when we come down to breakfast. 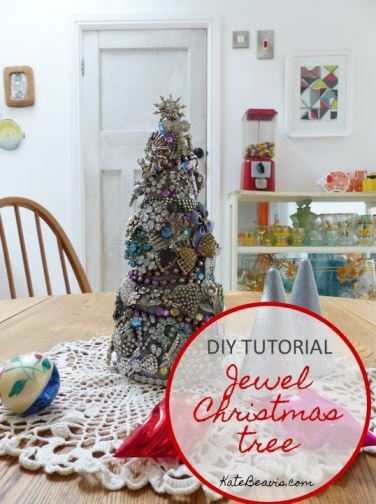 And the best bit is that none of it is permanent so you can remake it next year in different colours or simply reuse the brooches for another project. 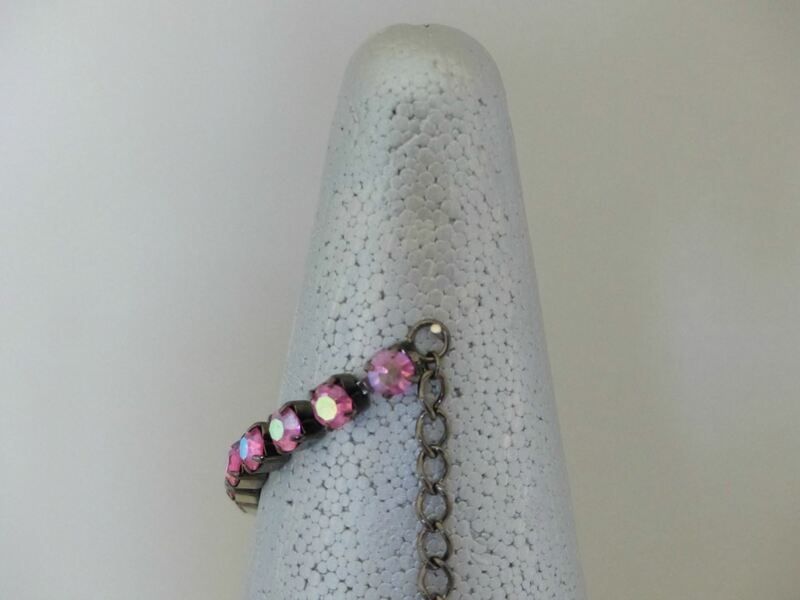 Broken vintage and modern jewels plus a few good ones too! 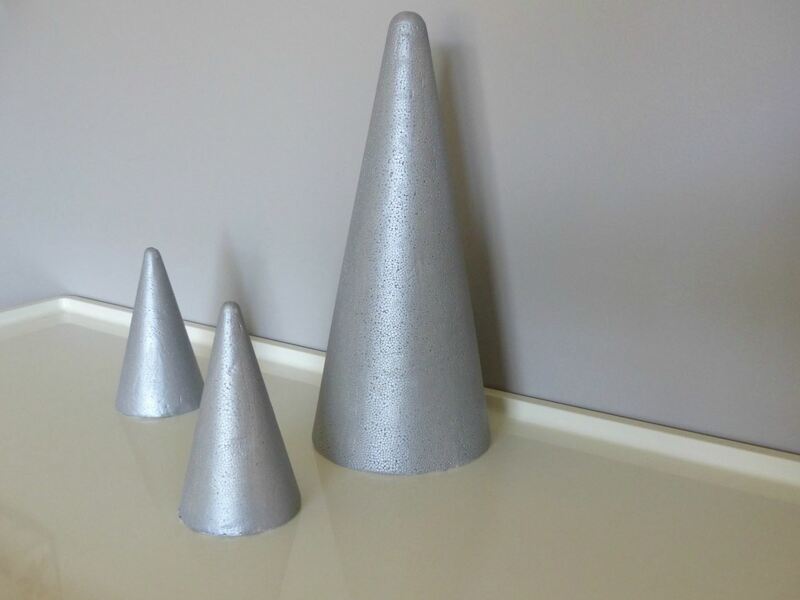 Paint the cones with a poster paint in a neutral colour. I chose a metallic silver grey to cover the white polystyrene as it blends in well with the rhinestone jewellery. Leave to dry and paint on a second coat if needed. Use poster paint or acrylic paint as any oil based paint or spray will “eat” the polystyrene resulting in a distorted cone shape. 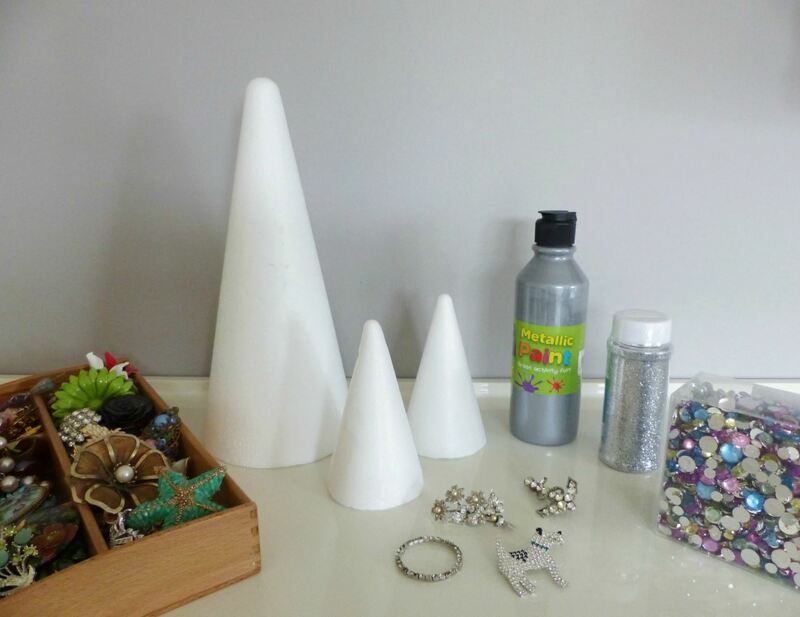 When the paint is fully dry start to pin the jewellery to the cone. 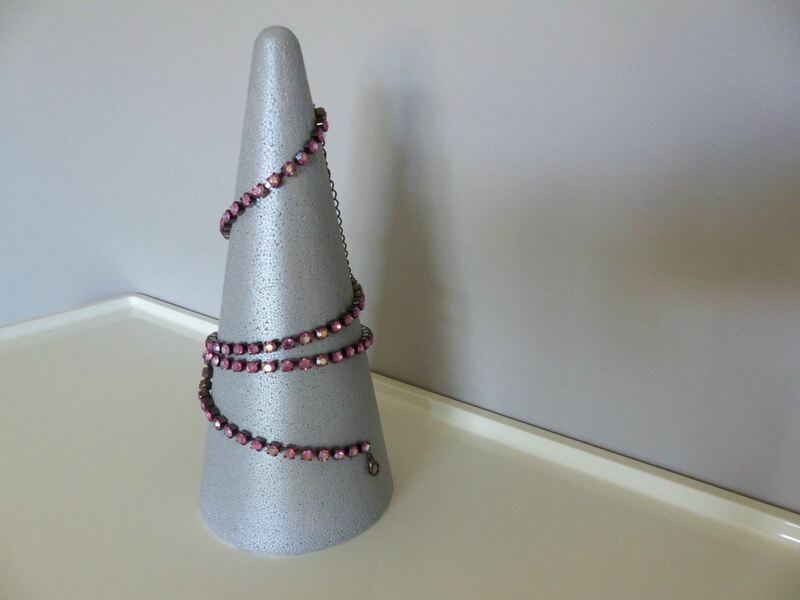 I started with necklaces, winding them around the cone. Use dress pins to secure them in place which means you can redo it as you go until you are happy with the positioning. When the necklaces are in place, pin the brooches in between. You can use the brooch pin to secure it too. 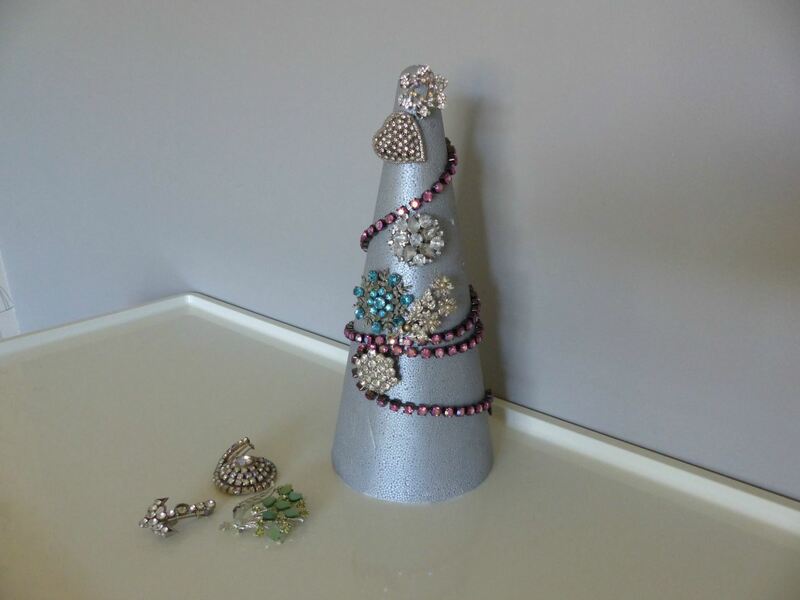 Choose a start shaped brooch for the top of the tree. Glue the acrylic gemstone in between to fill some of the gaps. Alternatively, dab some PVA glue in the gaps and sprinkle some glitter on top. I have also added two smaller glitter cones to my display. 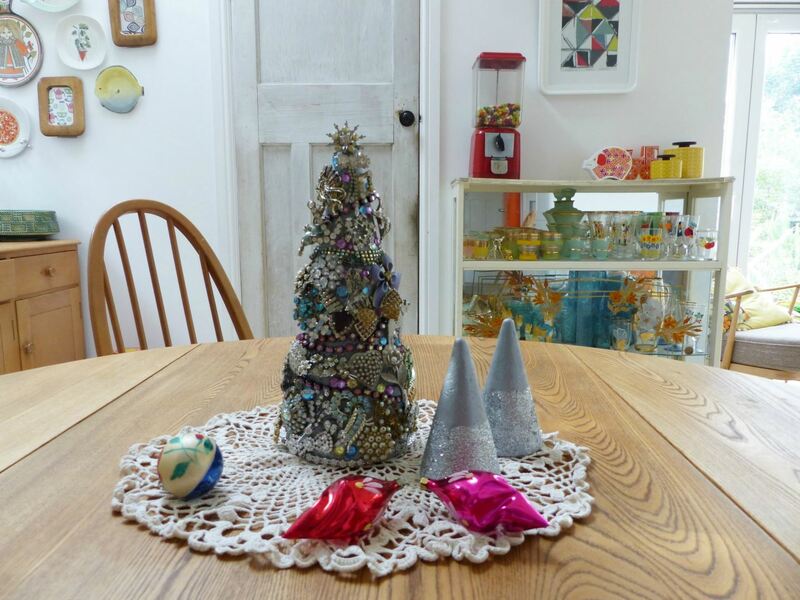 To make these, paint PVA glue to the bottom half of the cone and dip into a pot of glitter. 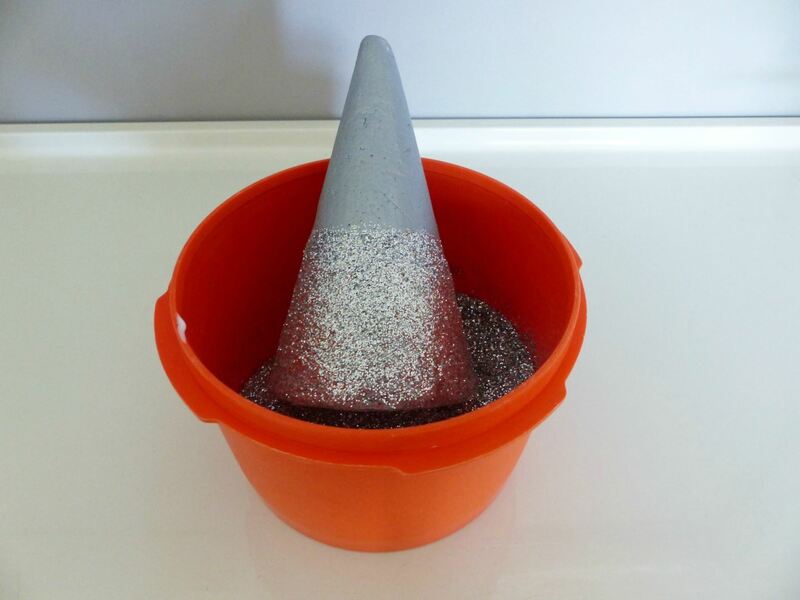 Alternatively, cover the whole cone with glitter or the excess acrylic gemstones. Create a table display on a silver platter or a vintage doily, adding some special vintage baubles alongside. This will look great as a table centre for a dinner party, teamed with crystal glasses to add even more sparkle. This is my article for Reloved Magazine, in the November issue. « Can you wear a vintage maxi dress in autumn/winter?